Training should be an integral part of a dog’s life. Training starts the moment a puppy is born. To watch a mother canine nurture and train her puppies is heart warming. However, since humans come along and interfere with the canine’s natural training, the human must understand the HOWS and WHYs for the canine training to continue and the human training to supplement. 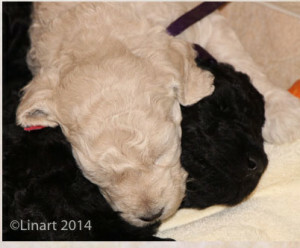 Here at Poodle Mojo, we work with the mother canine in the first 4 weeks of a puppies life. We have different techniques to stimulate and advance their little brains. This process is called Bio Sensor/Early Neurological Stimulation. These are a serious of exercises we preform daily from day 2/3 to day 16/17 of the puppies lives. Too busy to think about weaning right now! In the 4th week, the puppies will be moved from the whelping area to the weaning area. We do not start weaning our puppies until the mother is ready to do so. At this time, we introduce our puppies to their puppy mush. This is made with whole rolled oats, fresh raw goats milk and either farm eggs or organic eggs. We double charge the puppy mush with NuVet Plus to grow their immune system strong. We NEVER start the weaning process before the 4th week. Training by the canine mother in the third week is so important in a puppy’s development. The puppy needs this time with canine mom for correct emotional development. When the mother starts leaving the pups for longer intervals we now know it is time to transfer the puppies into the weaning box and start the weaning and potty box training. In the next 4 to 5 weeks we take over the mother canine’s training with the help of the other canine aunties and uncles, along with starting the human training of do’s and don’ts, so that a puppy from Poodle Mojo will, if protocol is followed, merge into your family with little effort. At 49 days, we do the Puppy Aptitude Test. We use the Volhard Test. The results along with our knowledge of each puppy helps us to place the puppy with the right human family. Since Poodles will need constant grooming throughout their lives, we start the grooming process around the 2nd week of their little lives. Poodles are born to groom. Poodles love to groom. They will be well acquainted with the process. Your puppy will come to you in the traditional Poodle Puppy Cut unless requested otherwise. We wisely encourage you to have your groomer lined up and take you puppy to the groomer as soon as she suggest. Most good groomers will only charge a nominal price for a puppy groom. They will then continue the puppy in the proper grooming protocol for a Poodle. Training & socialization is a daily activity at our place! Here you can see our pups training the girl to laugh and giggle at puppy licks! The poodle so loves to be with their humans and to please them. Their intelligence puts them far ahead of their humans. In fact, if the human does not have a plan and a routine in place for their puppy when they bring him home, the human will find that they are being trained by their Poodle. Training is about communication; about teaching ones Poodle what is acceptable and what is not acceptable. Good training creates a bond and loyalty that brings great pleasure to both Poodle and human companion(s). Training gives the Poodle security and sense of purpose in its life. Please read more about The Importance of Proper Training here.